Home Client Side Object Model (CSOM) Document Library PnP PowerShell PowerShell SharePoint Online SharePoint Online: How to Delete a Document Library using PowerShell? SharePoint Online: How to Delete a Document Library using PowerShell? 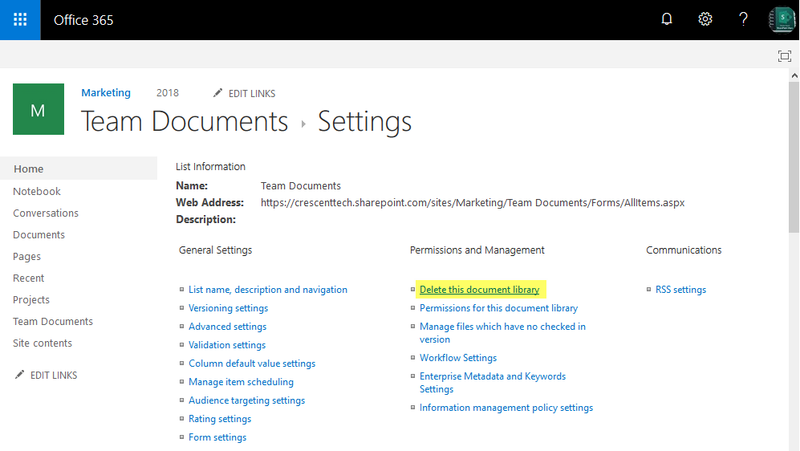 How to Delete a Document Library in SharePoint Online? Login to your SharePoint Online site >> Click on Settings gear >> Select Site contents from the menu. On the site contents page, Hover over the document library you want to delete and then click the context menu. From the menu, click on "Remove" and then confirm the prompt to send the document library to the Recycle Bin. 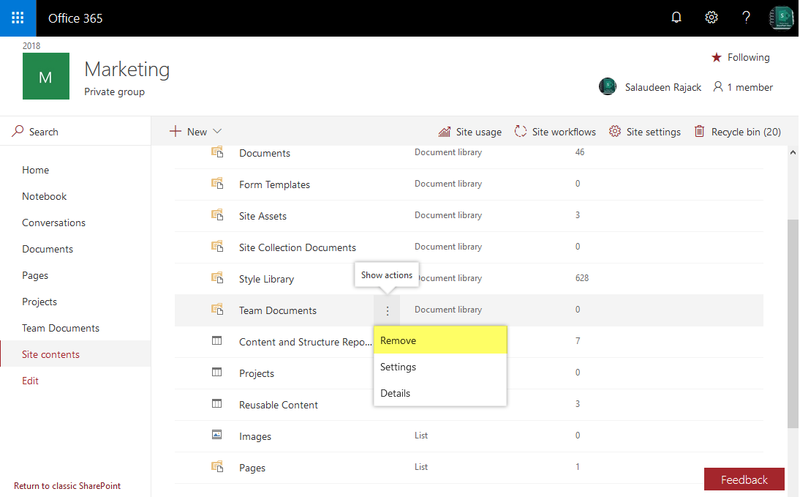 Alternatively, you can remove a document library in SharePoint Online by going to library settings >> Click on "Delete this Document Library" under Permissions and Management group. Quite simple, huh? Well, what if you don't find the delete option from the context menu or even in the document library's settings? What if you want to bulk delete multiple document libraries? PowerShell can help! Here is the SharePoint Online PowerShell to delete document library. Delete-SPODocumentLibrary -SiteURL "https://crescenttech.sharepoint.com/sites/Marketing/" -LibraryName "Team Documents"
Write-host -f Green "Library '$LibraryName' Deleted Successfully!" Write-host -f Yellow "Could not find Library '$LibraryName'"